English owes its position in the world to the power and influence of first the British Empire and later the USA; the establishment of America as Top Nation coincided with the emergence of modern popular culture. This differed from traditional folk cultures in that it was based on new mass media technologies and on capitalist democracy, through which collective taste could establish itself by quantity of sales. The USA developed the technologies, the markets and the new artforms; and American popular culture, much of it verbal in nature, conquered the world at lightning speed. Today we think of ‘American English’ as rhotic. That is, the most widespread and familiar kind of American accent preserves the historic r sounds which are indicated in spelling, but which back in London and much of England were lost except before a vowel – becoming ə or a lengthening of the preceding vowel. Paradoxically, however, popular culture as it spread from early 20th century America was to a large extent not rhotic. In particular, it came under three powerful phonetic influences: the South (notably African American English), the Northeast (notably New York City) and also to some degree the British Empire’s ‘Received Pronunciation’. Modern popular culture was substantially the creation of two ethnic minorities, both with histories of oppression. The emancipated slaves of the South created blues, ragtime and jazz, which they took to the cities of the North. In the West, the Hollywood studios were founded by Jews who had fled European poverty and persecution. The Warner brothers were from modern-day Poland, as was Goldwyn, while Mayer was born in Russia, Fox in Hungary, etc; they entered the USA through the Northeast, usually New York, where they picked up their English. Jewish New Yorkers were also particularly receptive to the new African American music, virtually industrializing it on New York’s Tin Pan Alley and Broadway. The creativity of these two peoples was unleashed in an economy that was erupting and had already surpassed that of Britain. 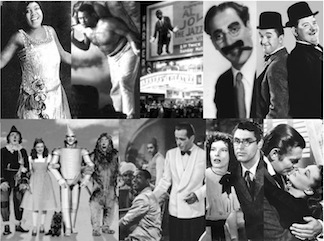 Hollywood was not of course phonetically homogeneous, and not everyone there spoke with the accents of its founders. Just as jazz singing was taken up by rhotic Midwesterners and Westerners like Bing Crosby, so Hollywood developed stars of a more western and more rhotic kind – often with an outdoorsy or small-town image – like John Wayne and James Stewart; and the recently-deceased Shirley Temple was a local girl, discovered by an LA talent scout. But the studios tended to look northeastwards, towards New York and Europe, and heavily drew talent from both. 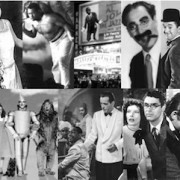 Hollywood’s large and hypo-rhotic British contingent included Laurel, Charlie Chaplin, Vivien Leigh, Cary Grant, Greer Garson, Ronald Colman, sisters Joan Fontaine and Olivia de Havilland, Basil Rathbone, Boris Karloff, Leslie Howard and many more; to these we might add Australian Errol Flynn. So, despite the fact that the USA itself was substantially rhotic, much of Hollywood’s golden age output was distinctly low in rhoticity. Let’s look at a few iconic films. According to the American Film Institute, the #1 male American screen legend was Humphrey Bogart (Cary Grant is #2; the top two ladies are Hepburn and Davis). Bogart’s most famous film, Casablanca, is a microcosm of Hollywood hypo-rhoticity. Lastly, Gone with the Wind, the grandest film of Hollywood’s golden age and for decades its highest earner. This was a sweeping but politically incorrect saga of the old South, where as John Wells tells us “There was still a landed gentry, who retained a strong association with England and continued to send their sons to be educated there” (Accents of English p.469). A felt association between Southern ‘gentility’ and RP probably lay behind the casting of Brits in three of the four main roles (Vivian Leigh, Leslie Howard and Olivia de Havilland). So how have things changed? What is the status of these three hypo-rhotic influences on popular culture today? For two of them, I think the change has been remarkably slight. African American English continues to lie at the heart of popular music and its singing style. American Theater Standard may be a dated concept today, but the status of RP-type British English in popular culture is, I think, much as it ever was. I’ll say more about these two cases in the next two posts. The biggest change by far has been the sidelining of hypo-rhotic Northeastern accents by the fully rhotic juggernaut of General American. As the 20th century progressed, America’s economic and demographic centre of gravity shifted westward. The heartland was largely white, gentile and rhotic, including many with Scots-Irish origins. They may have played a proportionally modest role in the creation of popular culture, but it was in the democratic nature of that culture to assimilate and reflect their speech. So was Moses, played by Illinois-born Charlton Heston; whereas the backsliding, golden-calf-worshipping Dathan was played by hypo-rhotic Jewish New Yorker Edward G. Robinson, born in Bucharest. In the early 1970s Johnny Carson moved his Tonight Show west from New York to California. A lot of publicity has been given to the show’s recent return to Manhattan after forty years. But where the last host, Jay Leno, was a variably rhotic New Englander, new man Jimmy Fallon is an upstate New Yorker who speaks GenAm. Geographically, The Tonight Show has gone back east; phonetically, it’s gone back west. In the “Singing In the Rain” excerpt, it is amusing to note that the elocution teacher hypercorrects, using a RP-ish BATH-type vowel not only in “can’t” but also in “stand”.